When you have been dealing with a chronic illness for over a third of your life, it becomes a part of you. It’s your version of normal. However, it’s only your version, not everyone else’s. And, this is never more apparent than when you are in a relationship. No one ever tells you that once you find someone who loves you, they might not love the challenges your relationship will face because of your health. At first, the symptoms are manageable and don’t seem that bad, the therapies don’t really interfere with your relationship—no biggie really. Yeah, you’re not normal, not fully healthy, but it’s manageable. At some point though, the reality sinks in: this thing is going to be around for awhile, it will impact your relationship and there are no guarantees. Then the bomb hits. You think you have someone who loves you for you, illness and all. You have to live with this, and they don’t. There’s the dilemna-do they stay or do they go? Do they face your illness’s challenges with you or not? No one can fully understand what you suffer with everyday, your trials and tribulations. How you can be perfectly fine one day and in agonizing pain the next day? Especially when you have fibro, where others can’t “see” your pain. How do you make them see what you are going through? Or how do you learn to set them free of your pain? I fear that I will never be strong enough to answer those two questions. powerfull post Amy. My wife has Endo, so I know what you mean with regards to a pain that can’t be “seen” it’s defiantely tough on relationships. Keep writing and othes will be inspired and maybe that positive energy will give you the knowledge to find the answers to those questions. Thanks TOTS. Please send your wife my love and keep sending the positive vibes to both of you. It takes a ton of courage, loving patience and understanding to be there for her in sickness and health. i know it’s not easy on your part – props! Wow, Amy this was a really moving post in more than one way. For one, I really liked that you used the picture from Calvin and Hobbs. My dad was a big fan of that comic series, and it always brings me back to childhood. Second, these are questions that I don’t think anyone could really answer. I guess when you have someone important in your life, you can only have faith that they will be willing to stick with you through the thick and thin. Funny – My Dad also loves Calvin and Hobbs. I have the same reaction to it. Faith and strength to accept whatever may come. Thanks for the inspiring post Amy! I also have to agree with Stephen’s statements here. My family always enjoyed the Calvin and Hobbs series, and I think that it’s usage is so fitting for what you are writing about. 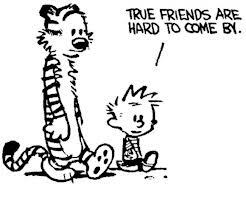 Calvin and Hobbs relationship (all be it imaginary) is one that can and will persevere in the face of even the worst odds. Amy, I feel what you’re going through. My own struggles with RA mirror yours, and I have the same questions and fears in my own heart and mind. And also the same lack of answers. I’m with you in solidarity, though. Thanks Austin for the support.